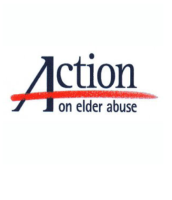 Action on Elder Abuse (AEA) is a specialist organisation. We focus exclusively on the issue of elder abuse, not as one issue among many, but as a single focus to our work. For this reason we have extensive expertise that is not available from any other charity or agency. AEA was established in 1993 by a group of practitioners from health and social care, and by academics and representatives of the voluntary sector who were concerned about the lack of information and assistance for those who were abused or were at risk of abusing. We address abuse within people's own homes (whether by family, friends or paid staff), within sheltered housing, and within care homes and hospitals. Our work is fundamental to challenging elder abuse in the UK and we constantly need financial support to continue our activities. Although we are as effective as many of the bigger charities, we receive only a fraction of their income.